In Parking Court, pretty much everybody is guilty. And therein lies the entertainment – the appeals of folks who feel unjustly victimized by tickets and sometimes costly fines for the likes of meter violations, cars partially blocking crosswalks, trucks left curbside in residential neighborhoods. I am one of them today, bringing before the District Court of Maryland in Baltimore my reasoning why a $32 ticket for a meter violation on Key Highway ought to be dismissed. The judge is a little late, the session having been scheduled for 9 a.m. – but that’s understandable. It’s a long drive from Annapolis, where she lives in the governor’s mansion. Presiding today is District Judge and Maryland First Lady Catherine Curran O’Malley. If there is any awed recognition in the packed courtroom as ‘Katie” O’Malley walks through the door from the judge’s chamber at 9:15 a.m., it’s not obvious. “All rise,” the bailiff intones, and the judge immediately waves them back down on the two lines of wooden benches. She is smiling and, I might add, looks very good in black. Parking Court is the most low-key of all judicial forums in Maryland, almost like the old days when lower courts were housed in police stations. The court building here is on the city’s south side, and named for the late John R. Hargrove – a jurist I had on a few occasions written about in my years as a newspaper reporter. The rules of the game are fairly simple – particularly since the front bench reserved for city parking ticket agents is the only one that is empty. Anyone who requested the presence of the ticket-issuing agent or police officer is going to win acquittal by default. And those who did not request the officer’s presence but wish to plead not guilty may have to make that request now, posing the inconvenient prospect of another trip to court. On the other hand, Judge O’Malley says, you may plead “guilty with explanation” in the hope that she will substantially reduce the amount of a fine or court costs. With a few exceptions, that’s the way the cases play out. There was, however, the guy who was ticketed for parking his city government car too close to a courthouse. He explains that his job is bringing folks like shooting victims to court, and that’s where he’s often parked in the line of his official duty -- without being ticketed. Her Honor is impressed, smiles, and gestures to the crowd – asking whether the people think he should be found not guilty. The ersatz jury, perhaps a little biased, is unanimous for acquittal. A few more cases... the guy with the big commercial truck, facing a fine of some $502, explains how he’s on the road a lot but stops when he can to spend some time with his wife, who has breast cancer. He wins a reduction to $50 plus the modest court costs. Crosswalk fine, reduced. Half a dozen names are called, all missing – “failure to appear” noted on the paperwork. “David Michael Ettlin, your honor,” I smile, and then – skipping over the formality of entering a plea – outline the facts, how I had parked after sunset at a meter along Key Highway, four or five blocks east of the American Visionary Art Museum, to attend the Oct. 8 opening party for its annual exhibition, and that the meter’s hours of operation could not be read in the dark. 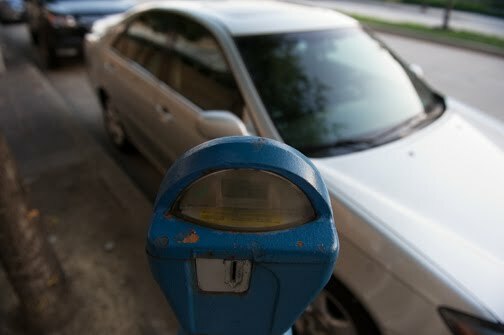 But I put in a few quarters anyway, just to be safe, to at least cover it past 9 p.m. – and returned a little later than that to find a ticket under the wiper blade. Inspecting the meter in daylight, I testified, I found it to be in effect 24 hours a day – and yet, the meters in the same block across the street were in operation only until 10 p.m. nightly. In fact, parking meters around Baltimore are widely varied in their times of operation and it becomes a guessing game when you can’t read the information housed under fogged and scratched meter covers like the one where I got the ticket. As evidence, I offered three 8-by-10 color photos, showing the meter in daylight, with its fogged plastic cover, and the still-leafy tree whose branches interfered with the streetlight above it. “What do you think?” Her Honor asked the jury of my ticketed peers. “Thank you, your honor,” I nodded. She hadn’t seemed to have recognized me, or wife Bonnie in the second row, though we had posed for a photograph with Judge O’Malley and her husband, Gov. Martin O’Malley, a few weeks ago – along with hundreds of other visitors -- during the mansion’s annual holiday open house. Perhaps wisely, I didn’t bring up in my testimony what I saw as arbitrary parking enforcement by the city. About three weeks after the Visionary party, we attended another affair there -- her husband’s election night Democratic victory party. Walking many blocks back down Key Highway, we saw lots of cars at expired parking meters, and not one had been ticketed.